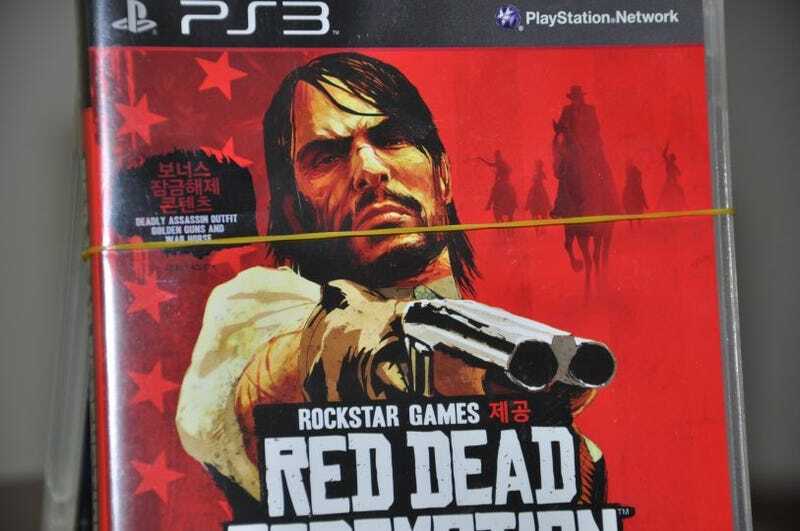 In the top picture, you can see a yellow rubber band running around the case of a Korean copy of Red Dead Redemption. That rubber band came free with a used copy of that game, and it holds together the disc case and a booklet in the back. That booklet is the Korean translation of the main game's script. Korean gamers want to play the same triple-A titles that everybody else does, but unfortunately, nobody dubs in Korean. That means Koreans have to do a bit of reading with their foreign language games. For example, Final Fantasy XIII-2 has Japanese audio and Korean subtitles. It's pretty nice for people who are interested in hearing a game in its native tongue, while simultaneously providing the necessary translations on the television screen. Other games give you a book to read. It must be uncomfortable having to follow the game's story while your eyes have to move back and forth between the screen and the book. It's better than nothing, right? I didn't need to use the book that came with Red Dead Redemption, but it was a neat oddity that I had never seen before. Look at the last three pictures in the gallery. That's Metal Gear Solid 4 in my hand and the accompanying book. I didn't read it all the way, since I wasn't going to buy the game, but it seemed to be a script-game guide hybrid. I thought it was funny that the thickness of the MGS4 book was the same as the one that was packaged with the Ico and Shadow of the Colossus Collection. Somebody must have done some kind of amazing editing job that you might say MGS4 didn't deserve, but needed. For the price of a little extra reading, either subtitles or booklet, I can definitely think of a few Japanese only games I wouldn't mind seeing make its way to the rest of the world. Any suggestions, Kotaku readers?